The Academy is the latest YTL Hotel in the UK, with interiors by Champalimaud Design; we have a look at its vintage-modern interiors. 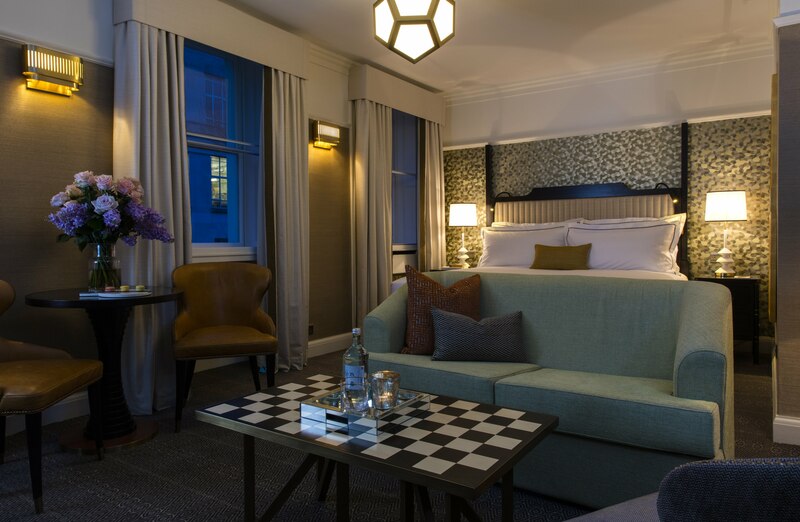 Footsteps from London’s bustling West End but tucked snugly away from the crowds, the Academy is a boutique luxury hotel situated in the heart of Bloomsbury. 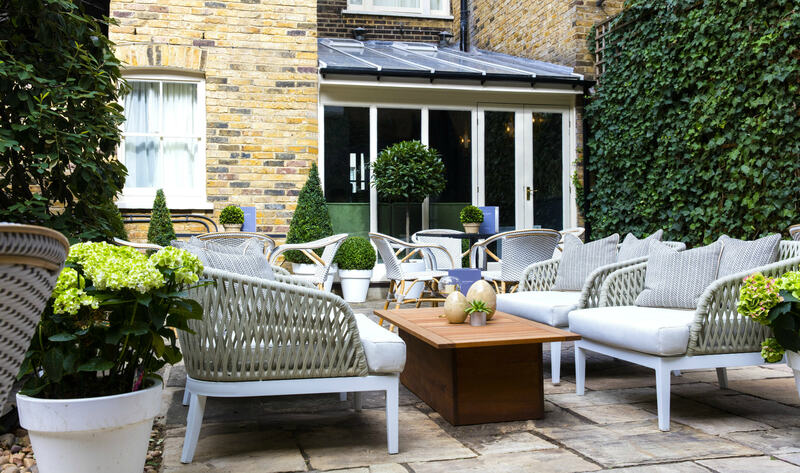 Comprised of five charming Georgian townhouses, the hotel has recently undergone a multi-million pound refurbishment after being taken over by YTL hotels. The Academy’s superb new interiors were designed by New York-based design studio, Champalimaud Design, with the comprehensive refurbishment overseen by the studio’s founder, Alexandra Champalimaud. 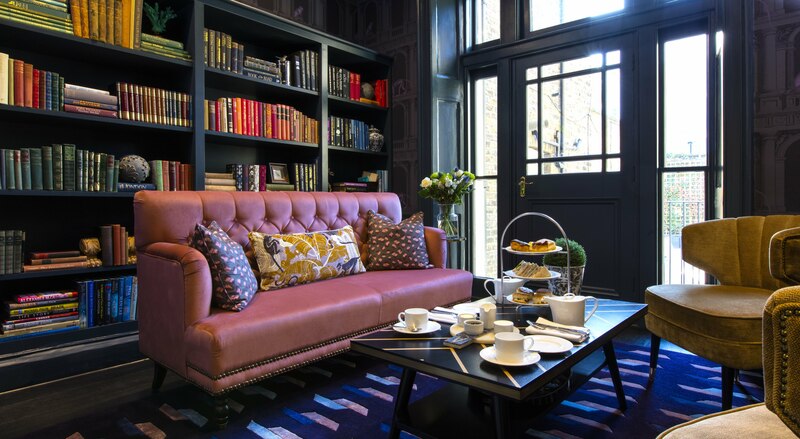 Discussing her inspiration for the hotel’s interiors, Champalimaud said, “We’ve created a nod to the Bloomsbury Set and their literary background; we’ve borrowed their magic and thinking, and made this into a very bookish, English hotel.” With inspiration from the famed Bloomsbury Set – who lived and worked in this area of London in the early 20th century – Champalimaud has created a collection of interiors that blend modern sophistication with vintage glamour. Each of the public spaces has intentionally been designed to be different – but complementary – to the others. 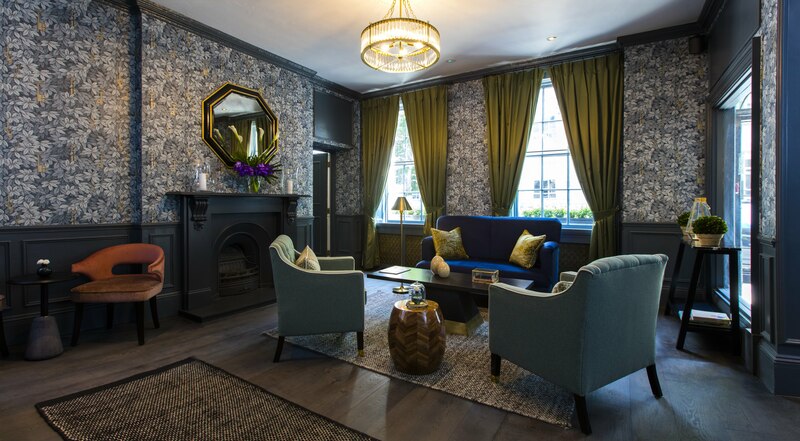 Entering the hotel from the main road, guests are welcomed into the Academy’s elegant reception; it features a deep blue colour scheme with touches of green and pink, and a fireplace that can be lit in the winter months to add to the cosy atmosphere. What immediately catches the eye, however, is the reception’s remarkable wallpaper. Consisting of patterns of leaves in different shades of blue and white, the wallpaper includes hidden golden keys, which easily mesmerise guests while they wait to be taken to their room. The lobby leads through to an equally sumptuous lounge with original architraving along one wall. Simple dark cyan walls are juxtaposed with flashes of blush pink, which is found in the velvet armchairs placed underneath the lounge’s windows. Champalimaud’s effortless blend of vintage and contemporary design continues throughout the room, from the Art Deco inspired light fixtures to the cosy fabric sofas. 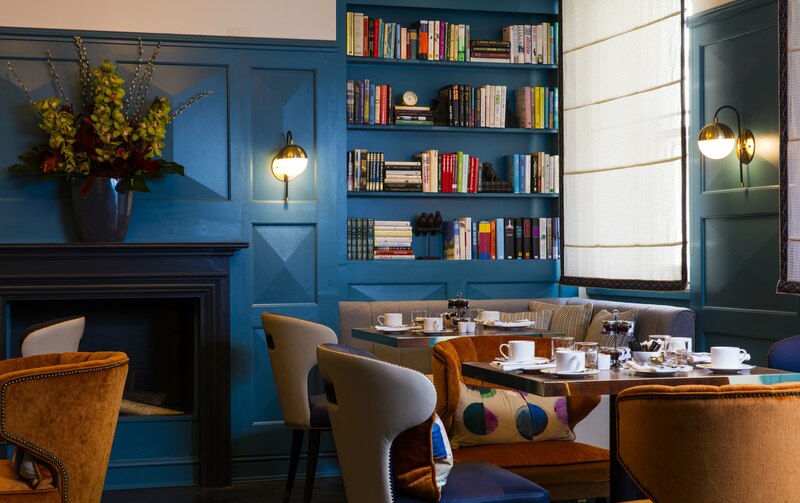 Across the corridor from the lounge lies the Academy’s ‘Alchemy Bar’ – which is arguably one of the smallest hotel bars in London. When asked about the size of the Alchemy, Champalimaud laughs. 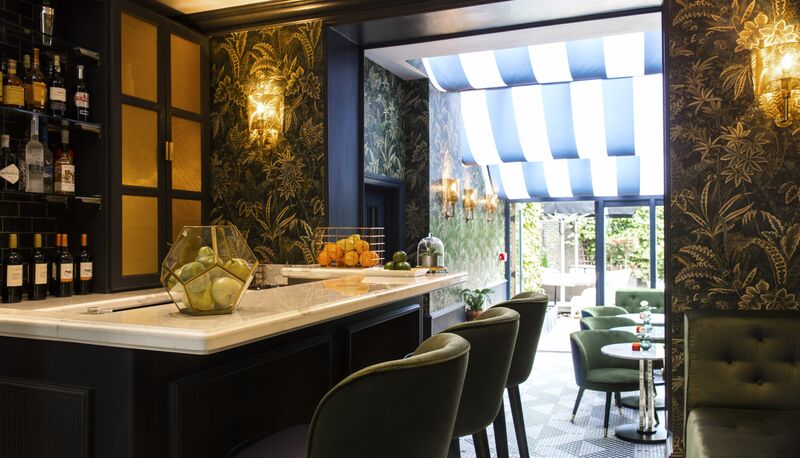 “We think that a small bar is a successful bar,” she says, “because everyone squeezes in around it!” Guests are likely to agree, but perhaps this is because the bar’s main seating area lies within a conservatory. Overhead, the glass roof is obscured by a delicate black and white canopy, which allows for ample daylight, but also creates a snug environment. 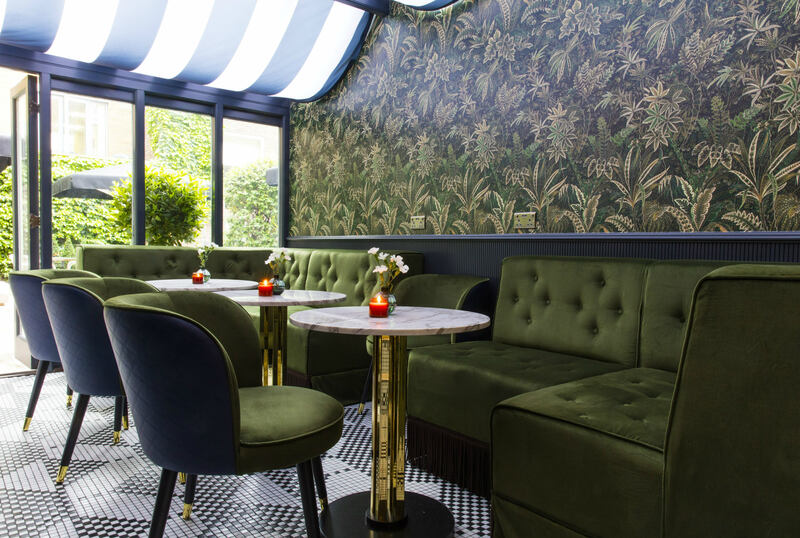 In the Alchemy itself, black and white tiles lie underfoot, and guests can choose to sit at the marble-topped bar, or descend into the conservatory to relax in olive-green velvet arm chairs. Again, the statement feature of the Alchemy is a vibrant wallpaper by Liberty. Similar to the wallpaper in reception, it is decorated with lush, tropical green foliage. Before the renovation, the Academy’s bar was located in the hotel basement, but since moving to the ground floor, a new space called ‘The Refectory’ has been created in the underground space. This is used as the breakfast lounge for guests, but can also act as a meeting room, or be transformed when the Academy hosts events. “Now we’ve reopened we are taking part in a lot of book launches,” Ball explains. Compared to the cosy, rich colours of the public spaces, the Academy’s guestrooms feel light and open. The high ceilings and large sash windows flood the rooms with natural light, and neutral tones have been used throughout; these contrast with copper elements and dark wood furnishings to create a timeless, sophisticated look. All the rooms feature identical fixtures and furnishings, but with different dimensions depending on the size of the space. For example, each of the suites features a living area – but may not have a fireplace. “The seating area divides the room into a sleeping area and a living area. [Each bedroom has] a lovely clean, traditional bathroom and art on the walls. 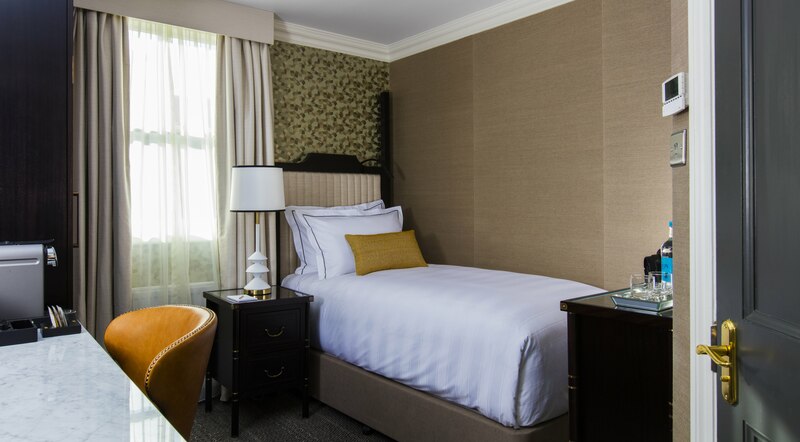 We loved all of [the fireplaces’] original detail and tiling; there are a few of them throughout the hotel and they all tell a slightly different story,” Mainer continues. At every turn, the Academy is brimming with thoughtful design and vibrant personality, whether guests are indulging in a cocktail at the Alchemy Bar or working in their hotel room. Combining luxurious touches with statement wallpapers and contemporary finishes, Champalimaud has ensured that the Academy remains a charming, historical hotel, worthy of its place as the latest edition to YTL Hotel’s prestigious UK portfolio.